Android Oreo 8.0 ROM for Motorola Moto Maxx LineageOS 15 has now arrived via an EXPERIMENTAL development build. This post provides the download link to LineageOS 15 ROM for Moto Maxx and guides through the installation process of the same. If you want the OFFICIAL LineageOS 15 update or some more Android Oreo ROMs then stay tuned to the LineageOS 15 ROMs page or the AOSP Android Oreo ROMs devices list page. This LineageOS 15 Oreo ROM for Moto Maxx is brought to you by developer calsurferpunk. THIS IS AN INITIAL BUILD WHICH MAY NOT BOOT AT ALL. HAVE A BACKUP BEFORE FLASHING THIS AND TRY AT YOUR OWN RISK. Installing a custom ROM on a Moto Maxx (quark) requires an unlocked bootloader on Moto Maxx (quark), which may VOID your warranty and may delete all your data. Before proceeding further you may consider backup all data on the phone. You are the only person doing changes to your phone and I cannot be held responsible for the mistakes done by you. – Here is theTWRP update guide for the Moto Maxx. This recovery guide requires an unlocked bootloader on the Moto Maxx. Download and Copy the GApps and the Moto Maxx LineageOS 15 ROM ZIP to your phone. First flash the Moto Maxx LineageOS 15 ROM ZIP from device. Then flash the GApps zip from your device memory. Reboot and Enjoy Android Oreo with LineageOS 15 ROM on Moto Maxx. 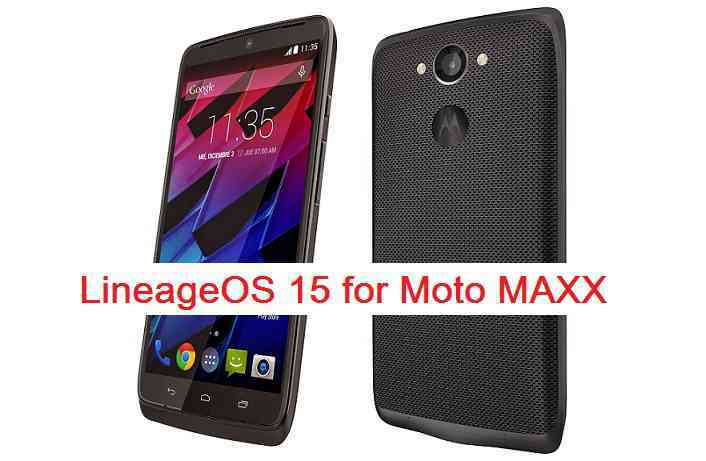 Copy the latest Moto Maxx Lineage 15 ROM ZIP file to your phone. Flash the LineageOS ROM ZIP from your phone. Then flash the LineageOS 15 Oreo GApps package. Stay tuned or Subscribe to the Moto Maxx (quark) forum For other Android Oreo, Nougat ROMs, LineageOS 15 ROMs, other custom ROMs and all other device specific topics. What error are you getting while installing this ROM? Do you have an error log or any error message that shows up on the screen? That’s not only me. It’s all users that have a Quark (Moto Maxx, Droid Turbo and Moto Turbo), as well the calsurferpunk. The error occur when you install it. Says that’s not the correct device and yes another one. It could just be the updater-script that prevents installing this ROM. Anyway, I have updated another link, which you can try to see if that installs !! I am a developer (linux and FreeBSD device driver developer) by profession and hence asked you the error logs (at the first place before suggesting you anything) to find possible information of the issue, which I could not get from you !! When you said it’s a common problem and everyone is facing this issue, then I thought it could just be the updater-script’s assert code that might be causing the issue (as it happens in most of the case) !! Anyway, it’s good to know that you found the root cause of the issue lies in the kernel and not else where. By the way, is it fixed or is the BUG still present ?? What exactly is the issue that is stopping the device from booting? This link is timing out or the file has been removed from the site. Anybody know where I can get the ROM for quark? Updated a new link. Can you check this one and let me know ?? ROM Download link is broken. There’s another source to download the ROM for quark?